If Esquire ever puts Touré on the cover of its magazine, it’s going to need to re-stage its iconic 1968 cover photo of Muhammad Ali. Not in the ironic sense that they’ve done it lately, but in a sincere sense that it’s appropriate. For there are few people who suffer the volume of unrelenting criticism, insult, and anger that is leveled at him on Twitter. That activity tells us a great deal about social media’s nasty side, and is a cautionary tale for anyone who views social media as merely a sort of chatty email. 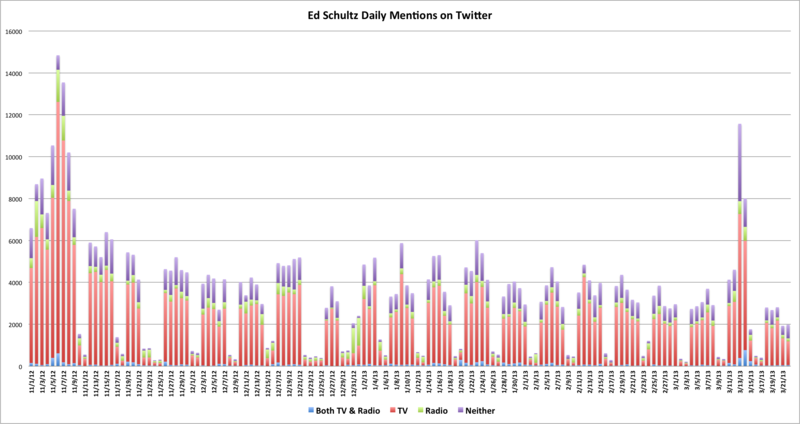 To get a sense of that nasty side, it’s interesting to do some statistical analysis on the Tweets he receives. Using the last week’s activity on Twitter as a sample, I discovered some interesting things. 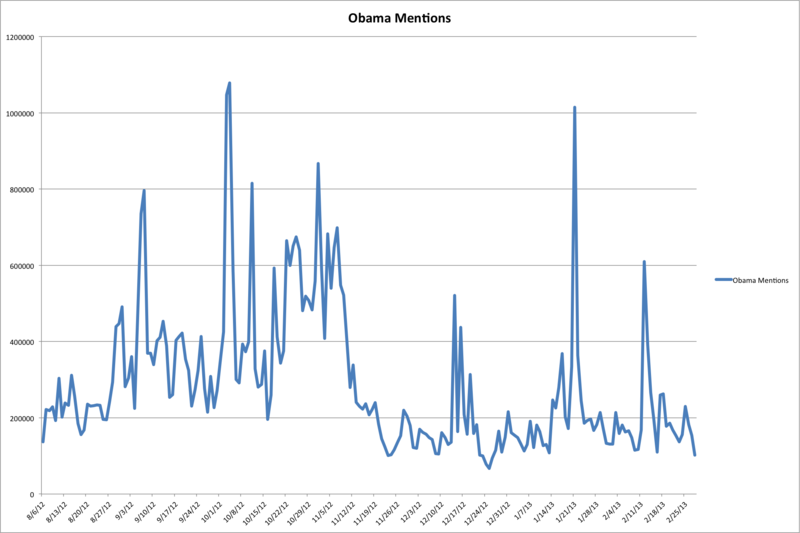 Obama Twitter mentions, August-February …. Some caveats: (1) during election night and a couple of the debates, Twitter’s API couldn’t keep up with the volume of tweets, and so my counts are too low. (2) How you define your search affects the counts. My search is somewhat narrow, and so that also will undercount tweets about the President. 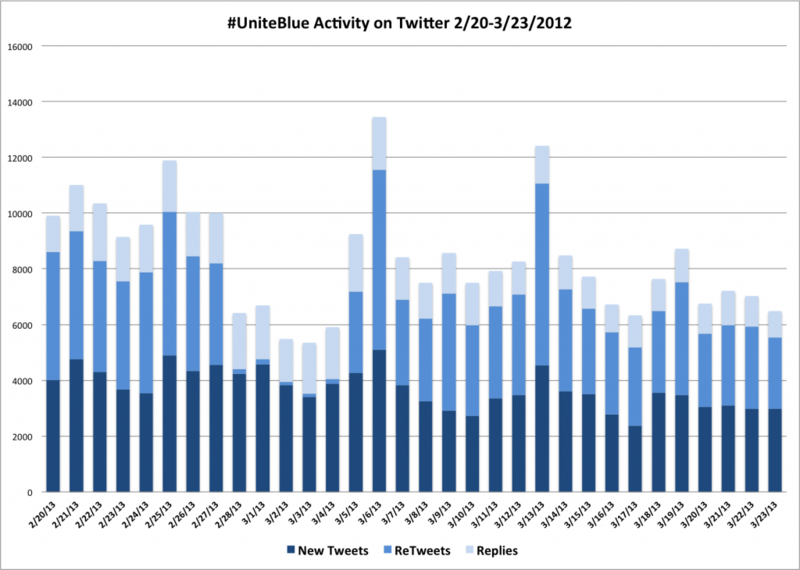 The hashtag #uniteblue and its associated web site, http://uniteblue.com, has galvanized a lot of liberal discussion on Twitter. It’s an incredibly clever way to not only coordinate messaging but a way to increase the clout (and, of course, Klout) of liberal Twitter users. If you haven’t looked into it yet, do so right now. I’ll wait. There’s so much more to it than what I’ve just described. 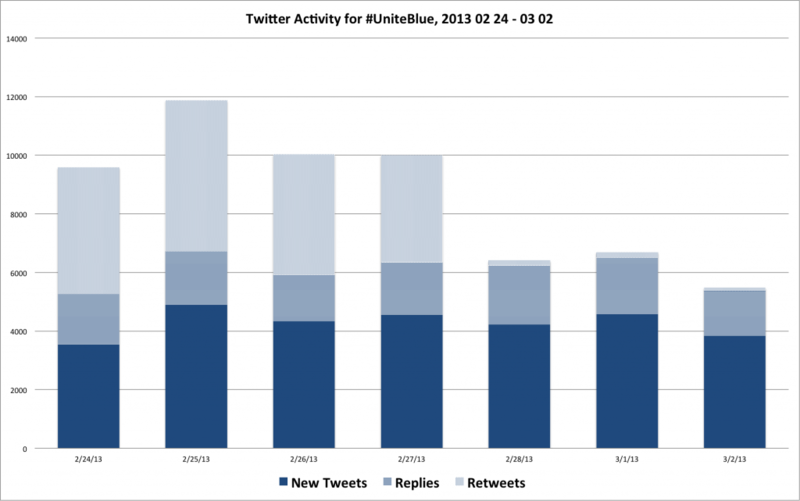 What’s especially amazing is the consistently high number of “new” tweets — that is, updates that are neither retweets or replies but are original compositions. That level of creative activity is very high for Twitter. Clearly there’s a dedicated group of people using the tag. 64 RT @UniteBlue: #UniteBlue is here to protect everyone on the Left, whether you join or not. Attacked by RWNJs? Let us know. We are here to help. 58 RT @UniteBlue: How does that sound as a goal #UniteBlue? Are you in?! RT @UniteBlue: Our Mission For 2014: Turn Red States Blue.